(From left) Tyler Long (bass), Joe Reinhart (guitar), Frances Quinlan (songwriter/vocalist/rhythm guitar), and Mark Quinlan (drums) at Headroom Studios. The cover of Bark Your Head Off, Dog, the new album by the Philadelphia band Hop Along, shows a painting of a tangle of trees that's the work of the band's frontwoman, Frances Quinlan. "I've been obsessed with painting trees for some time," says the singer and guitarist. "It's funny, because the woods are gorgeous. Everyone wants to live in the woods. But I've gone camping and been lost at night. There's a terror there." Quinlan didn't plan for the painting to land on the front of Bark Your Head Off, Dog (Saddle Creek *** 1/2), Hop Along's superb third album as a rock band and its first since 2015's Painted Shut. The widely acclaimed Painted Shut blew up nationally, setting up Bark Your Head Off, Dog to be one of most anticipated indie rock releases of the year. It became clear that Quinlan's tree painting offered an appropriate metaphor for Bark only after the band finished the album, which was recorded at Kensington's Headroom studio and produced by Hop Along guitarist Joe Reinhart, along with the band. That's because the songs, which were written well after the painting was completed, are in part about "being lost in one's self," says Quinlan, 31. "It's the discovery that you are no longer who you were, and there is no direction apparent as to who you should be from now on." That makes the album — which Hop Along will celebrate by playing a Free at Noon concert at World Cafe Live on Friday, April 13 and a sold-out show on Saturday, April 14 at Johnny Brenda's, where Quinlan worked as a restaurant host until last weekend — sound rather frightening. In fact, it's empowering, as well as being the most ambitious — and best – work to date by the band, who will return to play Union Transfer on May 19. The songs on Bark are by no means purely autobiographical. Quinlan, who was raised in North Jersey along with her brother Mark (who plays drums in the band) before moving to Perkiomenville in Montgomery County when she was 10, had plans to be a visual artist and a writer before music became her focus, and she typically draws from all sorts of source material. "Not Abel" was inspired by Norwegian author Karl Ove Knausgaard's 2004 novel A Time for Everything, which retells parts of the Bible emphasizing the humanity of the protagonists. Quinlan was moved to write the gripping "One That Suits Me" after listening to an 11-hour podcast about World War I. But themes emerge about the abuse of power, in mostly personal but also political, situations. "My songs tend to be about power struggles, because I consider myself somewhat powerless," she says. But Bark, in many ways, "is about standing on my own." "I think there are a lot of things that I have personally used as a crutch that don't work anymore. Like the need for validation. Or deferring to men." One lyric repeats in two songs: "So strange to be shaped by such strange men." Whether those malevolent males are public figures or private ones, "if you put that much power in the hands of somebody else, " she says, "you're bound to be disappointed." Didacticism is not Quinlan's thing. "If you told me to write a political song, I would be a mess," she says. "It never really works out for me. The song immediately starts working against me." But she's aiming to look outward as much as inward. "Nina Simone talks about how it's our responsibility to be a voice for our time," she says. "And I did try to address that we live in an uncomfortable time. [Not that] I'd want to be a woman in any other time. Forget it. No thanks!" Quinlan sat for an interview at Kensington's Soup Kitchen during a March blizzard after the band, which also includes bass player Tyler Long, had gathered at Headroom earlier in the day. They were just back from the South by Southwest music festival, where they had the eyes of the music industry upon them, including a gig at Willie Nelson's ranch outside Luck, Texas. It was a stressful experience, said Quinlan's brother Mark, 33, because of the rushed performance and technical challenges, "But I'm grateful that anyone cares to the degree that we get to play South By and people want to see us." 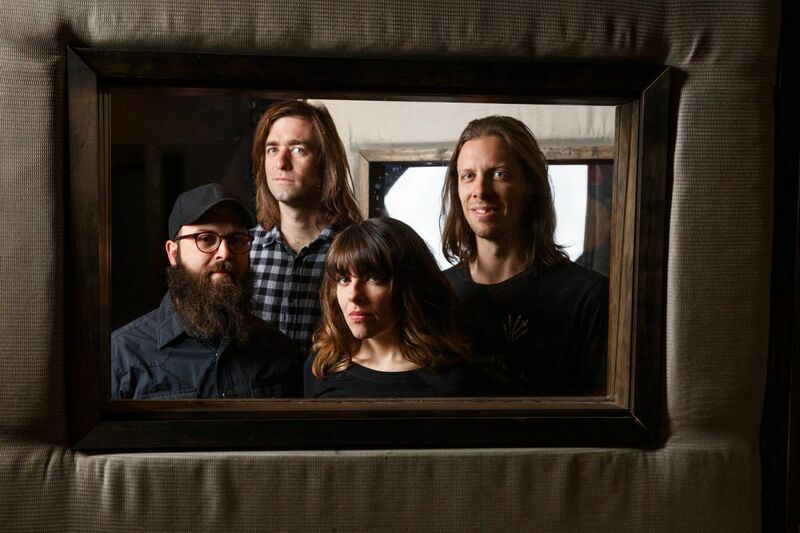 Frances Quinlan of Philadelphia band Hop Along holds open her journal showing drawings done when the band toured with her Saddle Creek labelmate Conor Oberst. The band worked intermittently on Bark over two years at Headroom, which Reinhart operates with partner Kyle Pulley. Before starting, the band worked up songs at the Delaware County rehearsal space of Dr. Dog, with whom Hop Along toured in 2015. The creative process is painstaking, with Quinlan typically bringing a song to the band that then is altered several times, with all the musicians having input. "There's never been a time when they're just playing behind me," says Quinlan. "that's not how we work. Even the most straightforward songs, there are nuances they bring to it. I think that's part of what make us dynamic. We seem to love complicating matters." Quinlan grew up listening to all kinds of music, from Marilyn Manson and Michael Jackson to Natalie Merchant and Sleater-Kinney. But she's a folkie at heart. A teenage Ani DiFranco and Bright Eyes fan, she first learned to play guitar on Patty Griffin's "Every Little Bit." Painted Shut paired that singer-songwriter sensibility with driving, near-punk rock force. But Bark Your Head Off is more subtle. She's trying to ease the burden on her voice. "I sing differently on this record," she says. "I tired to be more understated. I think in general we all did." The band employs more acoustic elements, and strings as well, including Mary Lattimore's harp on "How You Got Your Limp." "There are a lot more layers on this album … It's more about finding the character of the song, and what the song calls for." Bark is the band's second to come out on Saddle Creek, the Omaha, Neb., company cofounded by Bright Eyes' Conor Oberst. The label was one of many that rejected Quinlan's folkie first album, Freshman Year, which she released under the since-shortened name Hop Along, Queen Ansleis while a student at Baltimore's Maryland Institute College of Art in 2004. "I don't consider any of those years where nobody knew who I was a waste," Quinlan says. "I'm grateful to know what failure feels like, and what it feels like to put all of yourself into something and have it do … OK. It's not that I kept toiling away and nobody listened for 10 years. Enough people listened for me to know that there was something here, that I had to keep doing this." The success of Painted Shut and time spent touring it made Hop Along a better band. Quinlan and her bandmates are perfectionists convinced there's always room for improvement, so she stops short of saying that they completely hit it out of the park with Bark Your Head Off. "We're always trying to pull the best out of ourselves," Quinlan says. "But in this particular case, we had the benefit of experience and age. This is as close as I've ever come to saying what I want to. And what everybody played is as close to being right on as it's ever been."